Chart Tool - nice and simple! Where there is traffic and trends, there is money! Who said that you need to hire a marketing department in order to identify with growth trends and market niches? You have an opportunity on your own to enhance analytical capabilities and do it yourself and avoid the cost of such studies. 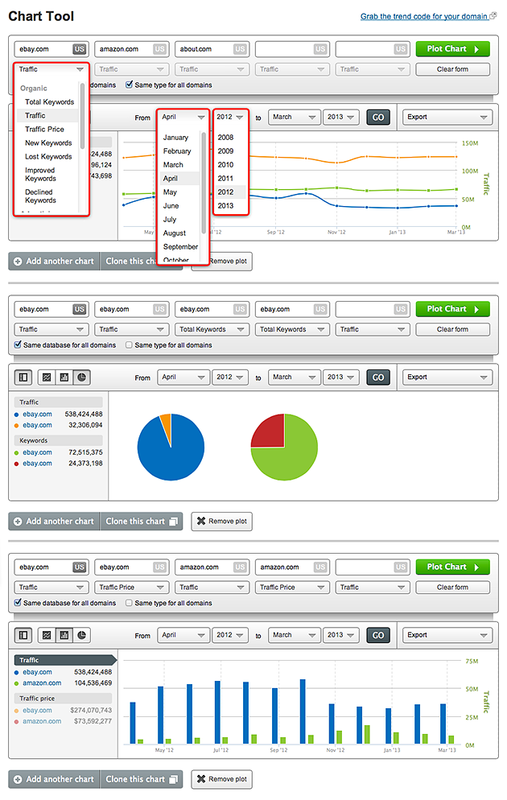 We present to you the newest chart tool with which you can compare up to 5 domains in 11 databases. You can compare the same domain as well as different domains within different databases at the same time. For example, you can determine 5 top competitors in the Competitors Report, and then go deeper in your studies to analyze trends within the market/niche that you are interested in. You can compare and analyze the number of keywords and amount of traffic according to approximate budgets, both in organic and AdWords. Also added is the ability to compare position changes (new / lost / improved / declined) for keywords. You can clearly see the movement of indicators for different criteria, and it is possible to add multiple chats simultaneously. You can identify the movement and direction that budgets are taking as well as the traffic in your niche market both locally and globally. This assists greatly in identifying trends such as increases or decreases. Different types of charts are available for use: line chart, bar chart (column chart), and pie chart. You are also able to create a combination of a few charts simultaneously. Using historical data, there are opportunities to identify trends and determine the priority direction of the nature of the motion parameters. Data is available all the way back to 2008! Therefore, you can see how domains have been developing since 2008, where the main competitions were organically, or even if they suddenly began purchasing AdWords. Overall, you can define the main trends for the time period of your choice. Time trends help in predicting the future trends for growth or decline. You can plan in advance and to be in the center of market trends, identify rising or falling trends, potential problems, and possibly define intermittent trends. This helps greatly in the preparation of an event or campaign. You can also forecast growth in marketing budgets, prepare a report on the main trends, and track trends in real time which gives current, relevant information. The trend + SEO = traffic. You can recognize from the dropdown on the trend that this project is not momentarily at its peak as it may have been before. To see when it was most in demand, locate the main trends for the last year and even prepare a report on the main trends of Internet traffic for the last five years or more. We highly recommend that you keep the Chart Tool on your desktop and/or in your bookmarks for quick access to analysis. This will help you to find market changes and compare the amount of traffic in a time warp. You can even place the Chart Tool on your website! All you need to do is click the link "Grab the trend code for your domain" to find out more.